Rydle is a Spanish Smash 4 Bayonetta main. 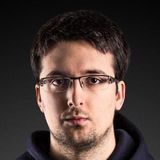 Before retiring he reached the number 1 spot in the Spanish Power Rankings and may have played a crucial role in the ban of Bayonetta in the Spanish scene back in patch 1.1.5. Rydle is now focusing on his League of Legends career, playing for the Spanish eSports team Pain Gaming. This page was last edited on January 23, 2019, at 22:40.